Bluelounge never ceases to amaze with their amazing yet very simplistic products like this one, the Kicks. These are very simple silicone-rubber rails that use a light 3M adhesive that won't leave any residue and makes re-applying a breeze. 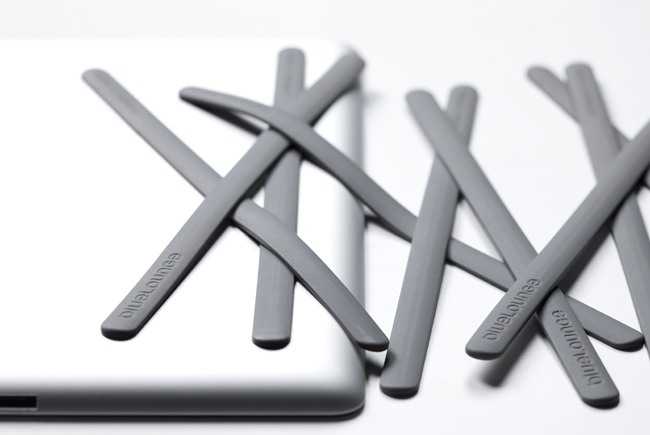 The gray colored silicone-rubber strips blends seamlessly against the back of your iPad 2, almost as if Apple themselves have designed them. We've seen similar add-ons like the iDroplets, but nothing close to what the Kicks have to offer. Positioning each strip along the back side of the iPad 2 allows you to set your iPad on any surface or prop it up against the edge of a sharp coffee table without scratching and harming the beautiful aluminum finish while adding traction too. The Kicks come in two pairs for $11.95, and are Smart Cover compatible as well. It begs the question, why haven't I though about this?